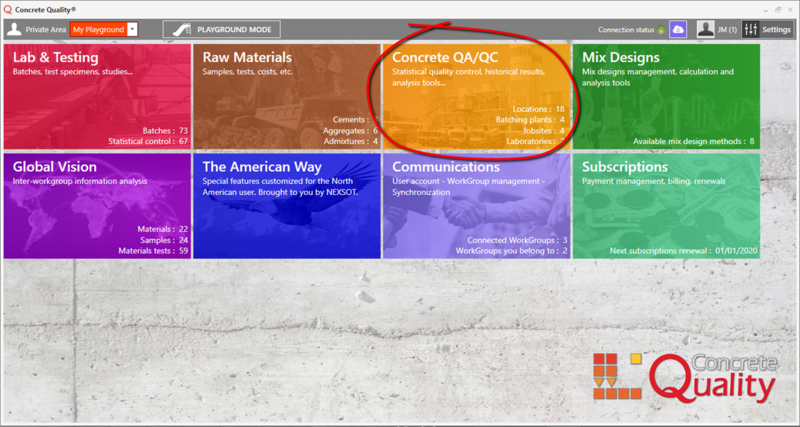 Inside the Concrete QA/QC section you will find several screens to manage your construction projects, batching plants, jobsites and the concrete delivered. Besides this you have a set of powerful and flexible data analysis tools at your disposal. 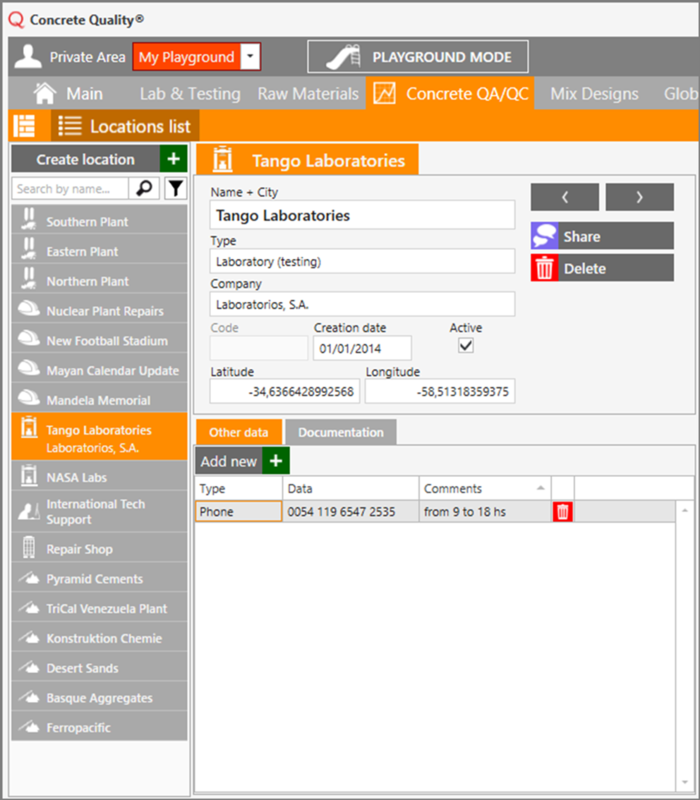 Locations management: create and manage Batching Plants, Jobsites, Laboratories, Suppliers, etc. You can see them in a convenient map (internet connection required) and for each location type you have the most relevant information related to it at a glance. Projects management: Projects gather information about the contract, contractors and the plants, jobsites and mix designs involved. 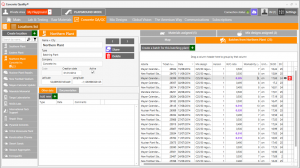 With that information you will automatically get all the concrete dispatched and you can print different reports in one click. Statistical Production Control: you’ll never use that old Excel file again! 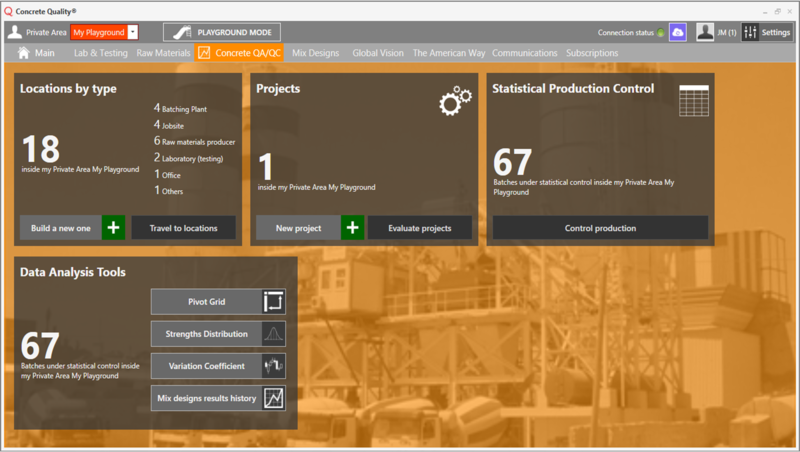 In this screen you can easily manage huge amounts of information about your concrete production, with the simplicity of a spreadsheet and the power behind a real database. This tool is the must-have for every production or quality engineer. Data Analysis Tools: a comprehensive set of the most useful statistical control tools at your disposal. Here you’ll find the infinitely flexible Pivot Grid, a Variation Coefficient calculation tool, historical data about your mix designs’ performance and a useful histogram tool to analyse the dispersion of strengths. 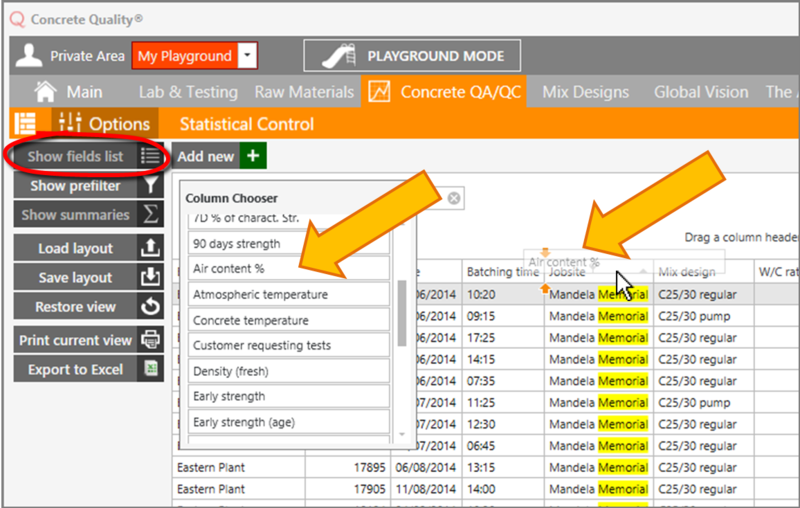 The Concrete QA/QC Dashboard shows an overview of the information contained in this section with its gadgets. From this Dashboard you can access all the screens inside the section. 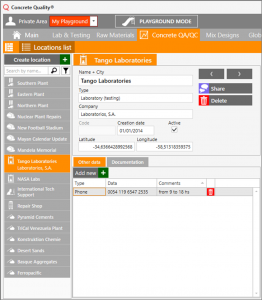 Within the Locations gadget you will find information about how many Locations you have in the currently selected Workgroup. They are also categorized by type (plant, jobsite, supplier, etc.) and you can use the hyperlink to access the Locations screen with a type filter applied. You can also create a new Location on the fly and edit it immediately. The Projects gadget works in a similar fashion to the Locations gadget. You can see how many projects you’ve got in your current Workgroup, access the Projects section directly or create a new Project and edit it immediately. 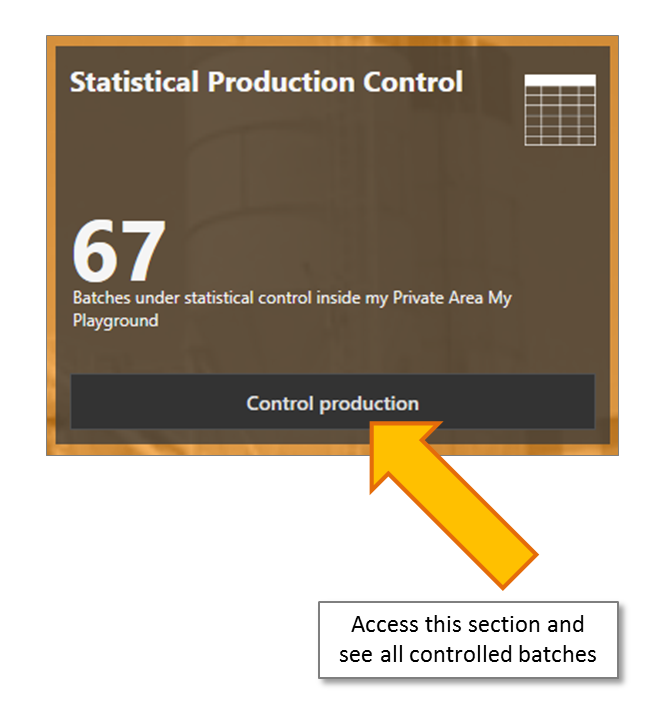 This simple gadget shows you the number of controlled batches in the current Workgroup and allow access to the Statistical Production Control screen. This simple gadget shows you the number of controlled batches in the current Workgroup and allow access to the different analysis tools screens. 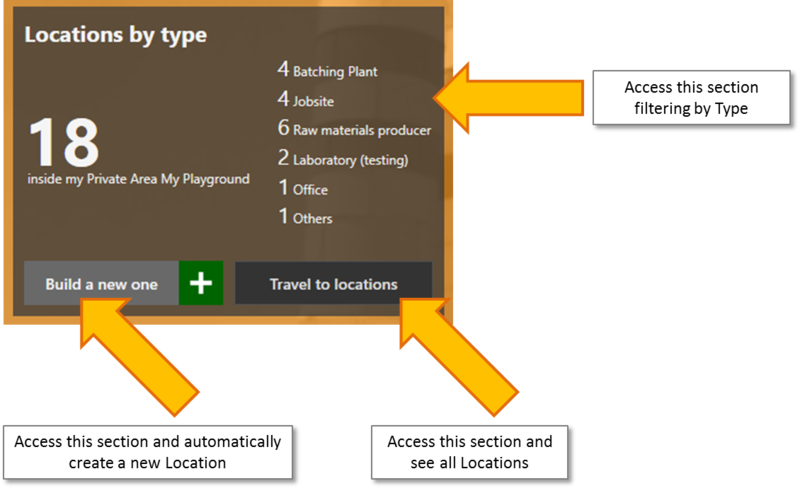 The Locations screen lets you create and manage things like Batching Plants, Jobsites, Laboratories, Suppliers, etc. Each Location is later referenced by other entities, such as a concrete batch related to a batching plant and jobsite, or a raw material related to a supplier. The Locations list: here you can see all the Locations contained in the currently selected Workgroup. The Locations on the list show some basic information, that will expand when you hover over them. Click on one of them to select it. You can show/hide the list with the “Locations list” button that just above the list, on the toolbar. You can also create new Locations and apply simple and advanced filters. The main panel: here you can see all the details of the selected location. You can edit its details here, add other data and documentation. The buttons let you select the previous/next location on the list, and delete the currently selected location. 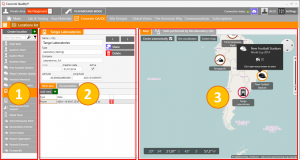 The map and highlights panel: The map tool allows you to find your locations and place them on the map. You can left-click on a locations icon to show a tooltip, and right-click to select it and center the map on the selected location. The different icons represent different location types, such as batching plants, jobsites, etc. Also dependent on the type is the other tab in this panel, called the Highlights panel (see more information about it below). Creating a Location is a very straightforward process. You can use the button in the Locations gadget to create one, or use the Create Location button on top of the Locations list. If there are no Locations on the list (because there is a filter applied with no results, or you just never created one) you will see another Create Location button in the place of the Main Panel. You can use any of these buttons to create a new Location. One of the most important properties of a Location is its Type. You have a green combobox just below the location’s name to select it. It’s important to choose the correct type, so you can find your location in the right places. For example, when you choose a raw material’s supplier, only the locations of the “Raw materials producer” type can be selected. The type also affects the kind of information you will find in the Highlights Panel. The Highlights panel is located on the right half of the Locations screen. It contains a map to see all your locations, and other tabs that differ depending the Type of the currently selected Location. It’s function is to provide additional functionalities and to list relevant entities related to the Location. We will discuss the last three in detail, for the map is common to all types. Assigned Materials: here you can choose which of the raw materials contained in the currently active Workgroup are available at this plant, and assign them to it. This is convenient but not mandatory. The advantage of assigning materials is that they will be displayed first in lists related to this plant, but you will always be able so select any material. You can drag & drop items from one list to the other to assign or unassign them. 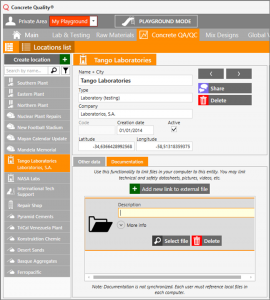 Assigned Mix Designs: here you can choose which of the mix designs contained in the currently active Workgroup are available at this plant, and assign them to it. This is convenient but not mandatory. The advantage of assigning mix designs is that they will be displayed first in lists related to this plant, but you will always be able so select any mix design. Batches from this plant: in this tab you can see all the batches that were produced at this plant with basic information, edit them and create new batches that will be assigned automatically to this plant. You can see more details about the selected batch by clicking the “more details” button on the right column; this action will take you to the Statistical Control screen with your batch selected. We will discuss the last one in detail, for the map is common to all types. Batches sent to this jobsite: in this tab you can see all the batches that were delivered to this jobsite with basic information, edit them and create new batches that will be assigned automatically to this jobsite. 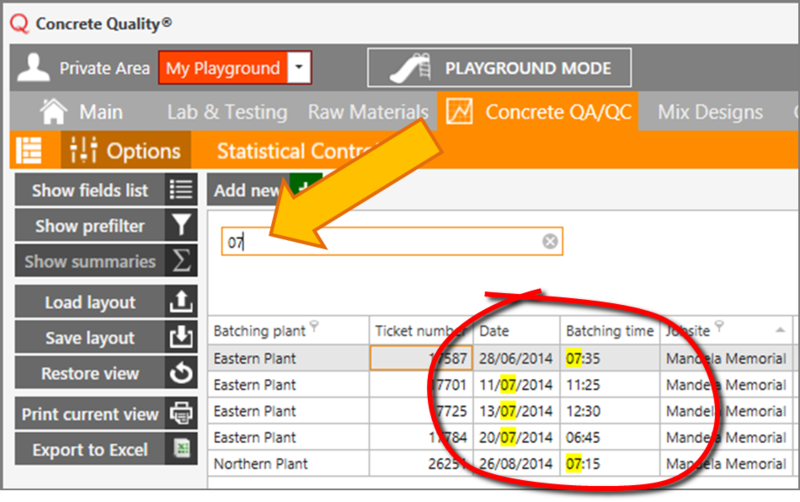 You can see more details about the selected batch by clicking the “more details” button on the right column; this action will take you to the Statistical Control screen with your batch selected. Tests performed by this lab: in this tab you can see all the raw materials tests that were were performed by this laboratory with basic information. 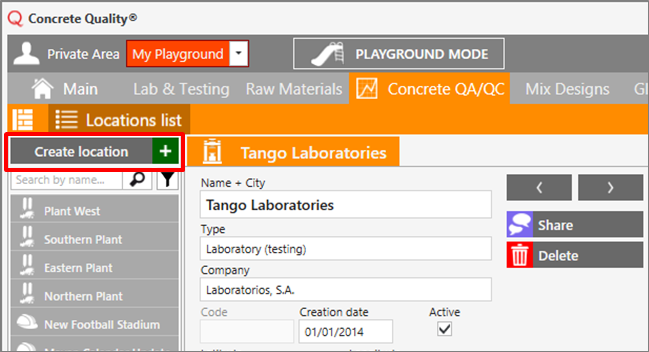 You can see more details about the selected test by clicking the “more details” button on the left column; this action will take you to the corresponding raw material type screen with the material and sample selected. 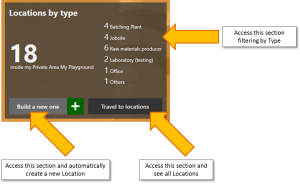 Supplied materials: in this tab you can see a list of the raw materials supplied by this producer, with some basic information about them You can select one and click on the “more details” button to go to the corresponding raw material type screen with the material selected. Other types of Locations are only placeholders for auxiliary information, so they only have the Map in their Highlights panel. In the lower part of the Main panel you’ll find two tabs with secondary information. 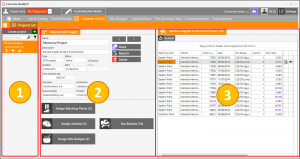 This data is completely optional for the operation of the software, but it allows you to complete the information recorded about your Locations. Other Data: this is simply a list where you can write down secondary information about your locations. Phone numbers, PO boxes, delivery instructions, etc. The information entered here will not affect other screens of the app. Documentation: use this feature to link this Location to files stored in your local computer, such as pictures, videos, certificates, etc. Keep in mind that this information is only valid for your computer and will not be synchronized. Projects gather information about the contract, contractors, subcontractors, etc., and the plants, jobsites and mix designs involved in a construction project. 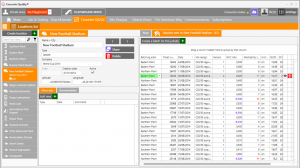 With that information you will automatically get all the concrete dispatched and you can print different reports in one click. The Projects list: here you can see all the Projects contained in the currently selected Workgroup. The Projects on the list show some basic information that will expand when you hover over them. Click on one of them to select it. 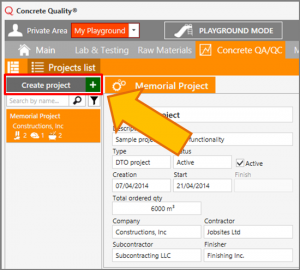 You can show/hide the list with the “Projects list” button that just above the list, on the toolbar. You can also create new Projects and apply simple and advanced filters. The main panel: here you can see all the details of the selected Project. 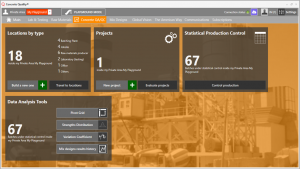 You can edit its details here, and access the functions to assign batching plants, jobsites, mix designs and see the batches delivered to this Project. The buttons in the lower half of this panel allow access to these functions. The navigation buttons let you select the previous/next Project on the list, print reports and delete the currently selected Project. Deleting the Project will not delete any location, mix design or batch. 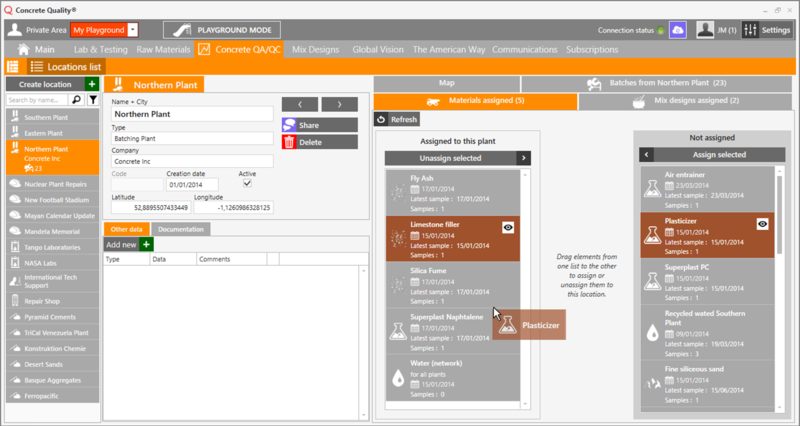 Secondary panel: on the right side you can see the secondary panel, which allows you to assign/unassign batching plants, jobsites, mix designs and see the batches delivered to this Project. Use the buttons in the lower half of the main panel to change the view in this panel. Creating a new Project is a very straightforward process. 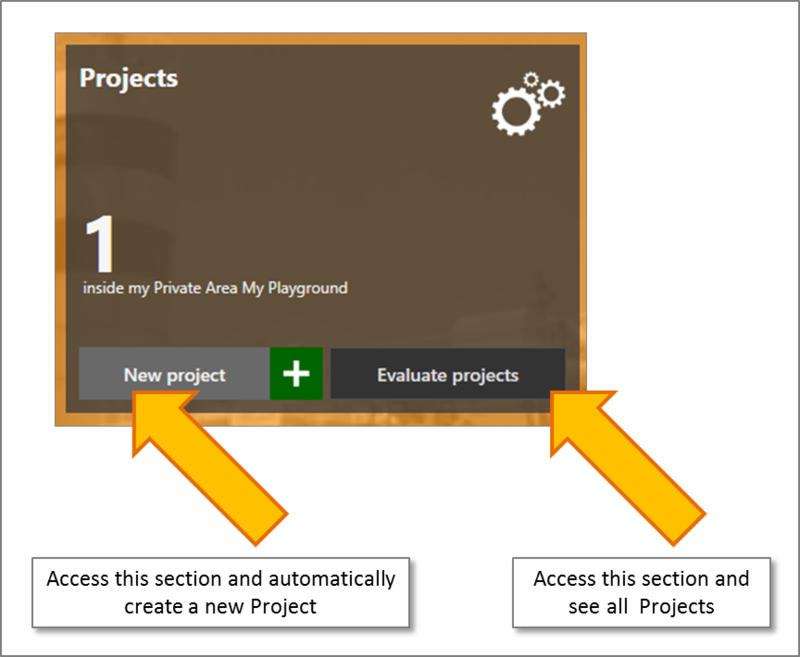 You can use the button in the Projects gadget to create one, or use the Create Project button on top of the Projects list. 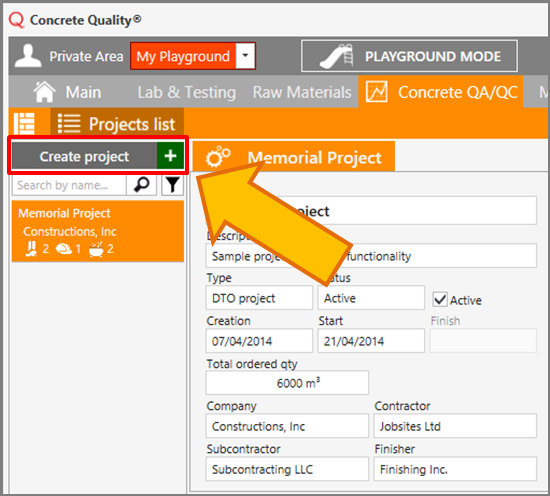 If there are no Projects on the list (because there is a filter applied with no results, or you just never created one) you will see another Create Project button in the place of the Main Panel. You can use any of these buttons to create a new one. Proejcts work as a filter of sorts for the batches in your Workgroup. When you create a new Project remember to set at least the project’s Start Date. 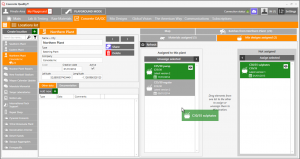 Without a Start Date the software will not know which batches correspong to this Project, even if you assign plants, jobsites and mix designs. The End Date is optional. If you set both the Start and End Date, you’ll get the batches within that time span. If you forget to set the dates you’ll see a message in the secondary panel (when you see the batches) that will remind you of it. As mentioned before, a Project acts as a filter of batches. In order for the Project to know which batches correspond to it, you need to assign batching plants, jobsites and mix designs. The Project will list all the batches that match the criteria, that means all the batches that have any of the assigned plants, jobsites, mix designs and that were produced between the Project’s start and end date. 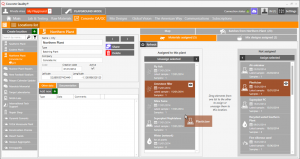 To assign or unassign plants, jobsites and mix designs click on the corresponding buttons found in the lower half of the main panel. The secondary panel will show you two lists next to each other: assigned and unassigned. 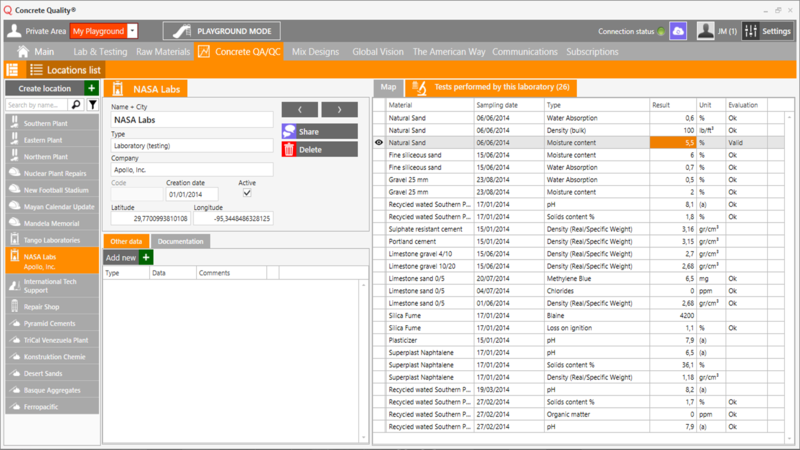 You can drag & drop items from one list to the other to assign or unassign them. 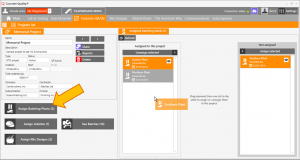 The assignment/unassignment works exactly the same for plants, jobsites and mix designs. The last view in the secondary panel is the Batches view. Here you will find all the batches that match the criteria of the selected Project: plant, jobsite, mix design and dates. 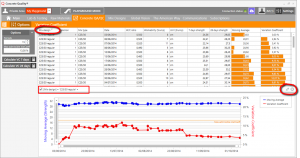 You will be able to see and modify the most relevant batch information, print batch’s report and see its details in the Statistical Control screen. Project report: a basic printout of the Projects information, with the number of plants, batches and jobsites assigned (but not listed). 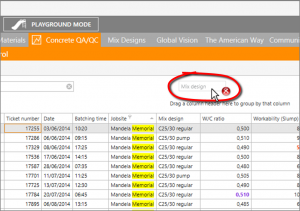 For the Mix Designs you can print a project-specific report by selecting a Mix Design and clicking on its report button. To print a batch report related to this project, select the batches view in the secondary panel, select a batch and use the report button that you’ll find in the right column. The Statistical Production Control screen is the must-have tool for every production and quality control manager. 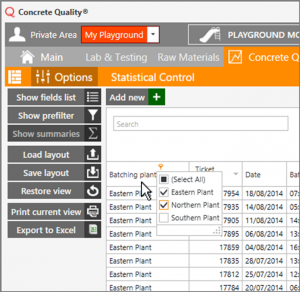 Easy to use as an Excel spreadsheet but powerful as a real database, it’s the ultimate tool to keep track of the quality of your concrete production. Options and functions: contains many options to show/hide panels, filter, save and restore custom views, exporting and reporting options. 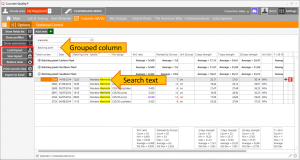 Search and Group panel: this panel has a very convenient search box that will look for the piece of text you type in in every column, it will filter the rows that contain your text and it will highlight it. Works with names, numbers, units and dates. Below the search box you have the Group panel, where you can drag & drop columns to group your batches by them. You can darg any number of columns here, and reorder the grouping to see your data exactly the way you want. Samples (batches) table: this is the main part of the Statistical Control screen. 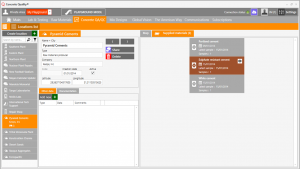 You can see and modify your samples (a.k.a. batches), sort them by clicking on the column headers, and filter them as well. You can drag & drop column header to order them to your liking. You can delete the selected batch by clicking the red trashcan button on the right column, or see more details in the Batches section. 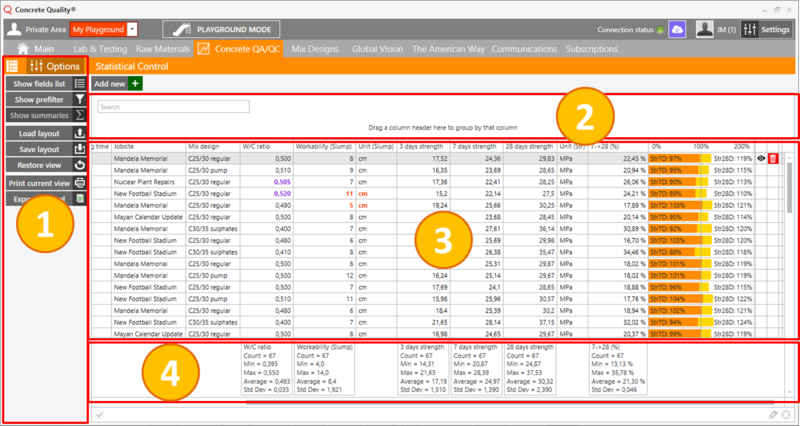 Summaries panel: You will automatically see the count, average, min/max and standard deviation for your batches in the summaries panel. You can show/hide this panel from the Options panel. This is very convenient, as it will update its information when you filter and group your batches. Adding a new sample (also referred to as “batch”) is quite a straightforward process. Simply click on the “Add new” button on the top left corner of the Search and Group panel. Keep in mind that your new batch has no information about batching plant, jobsite, mix design, etc. when you create it, so if you have any filters applied you may not see it. Try removing your filters and look at the bottom of the table. The Statistical Control table is very flexible and powerful. 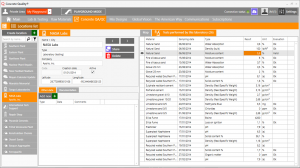 You can use it like your standard spreasheet table, with the usual cell selection and navigation. Besides that, you can reorder the columns by dragging their headers to a new position, or you can group by any column. Grouping works by creating a category for each value contained in the selected column, and then putting all the batches that correspond to that value together. 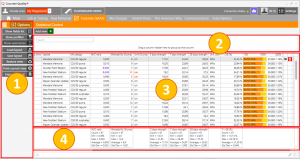 Groups can be collapsed or expanded for a convenient visualization of the data, and the group header row will show you summaries of the values contained in each column inside the group. In the picture above we are grouping by batching plant, and we expanded the “Southern Plant” group. 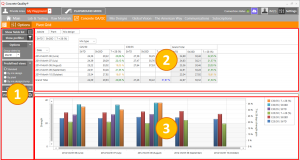 As you can see, the group headers contain average values for the W/C, Slump and Strength columns. The highlighted text shows that the search field (just below the Add new button) works even when the batches are grouped. In the Options panel you will see three buttons that relate to the customized views you can create. 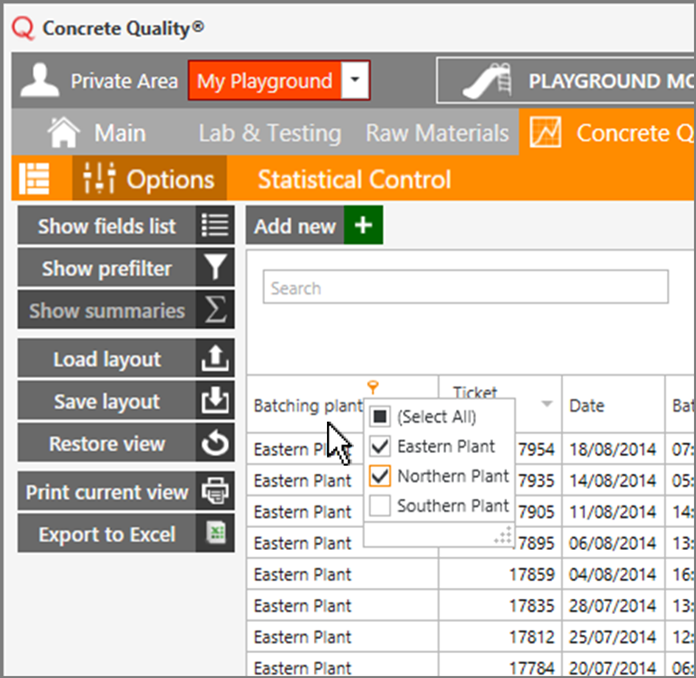 If you like to see batches always your way, you can save the columns order, filters, grouping and width with the Save Layout button. Use the Load Layout to restore your saved layout. The Restore view button displays the table with the default arrangement of columns, filters (none) and grouping (none). As you know, each batch can contain more information than it’s displayed in the standard view. You may want to see additional columns, or remove some of them to reduce the amount of information displayed. To remove a column, simply “click and hold” on its header and drag it outside the table (and also outside the group panel) until you see a red cross icon. If you release the column header there, you will remove it from the current view. The column you just removed is not deleted, it’s only hidden. 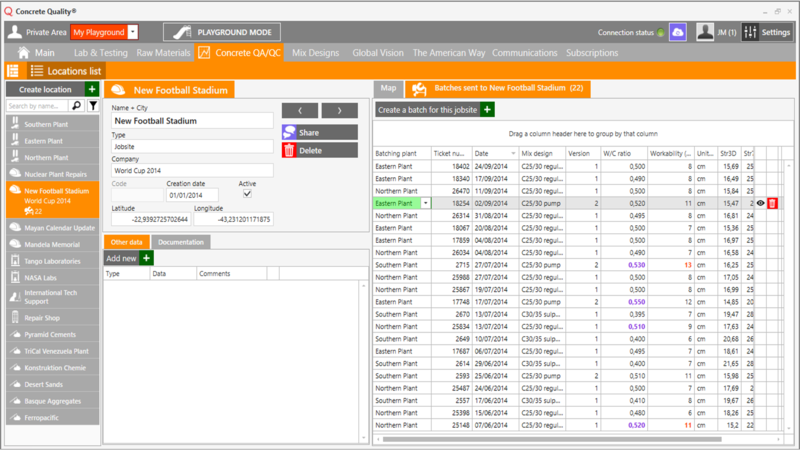 To see all hidden columns and to be able to bring them back to view, click on the Show fields list button in the Options panel. This will show a floating window that contains all available columns for the table. Drag and drop the column headers in this window to the table, in the position you want them. 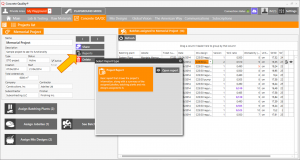 The Statistical Control screen offers powerful filtering capabilites. You can create very simple filters in seconds, or use the advanced filtering features to get exactly the information you need. The Search Panel: you can enter any piece of text and it will look for it inside all your visible rows. It will show only the rows that contain that piece of text, and it will highlight it inside the cells to make it easier to find. Keep in mind that it will look in ALL columns, so if you look for numbers you will find results in Strength, Slump, Dates, etc. You can click on the cross button that appears inside the Search Panel to remove the filter (visible only when a filter is applied). The column’s autofilter: each column header displays a small filter icon when you hover over it with your mouse. Click on this icon to display a categories popup where you can select any combination of categories to display by checking them. The filters applied this way to different columns are cummulative. The prefilter: click on the Show prefilter button in the Options panel to show an advanced filter editor window. With it you can create complex filters with any number of conditions, AND/OR decisions, union, intersection, not included, etc. Play with it to see all its possibilities, you will be amazed! You can enable and disable filters at the bottom of the table by checking/unchecking them. You can also access the advanced filter window or remove the filters entirely with the buttons at the bottom right. 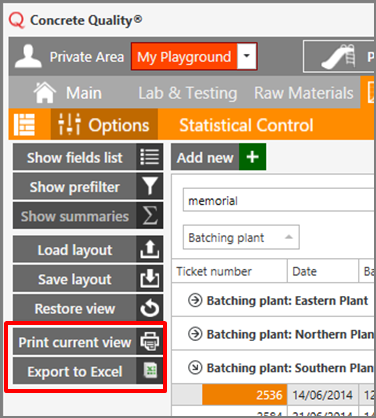 You can print and export your current view with the Print current view and Export to Excel buttons in the Options panel. Printing and exporting is WYSIWIG (What You See Is What You Get), so keep in mind that information contained inside collapsed groups will not be printed or exported. 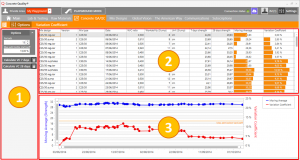 The Pivot Grid presents statistical production control information in an aggregated way, and lets you easily and intuitively modify the way you see that information. As a data analysis tool it’s very powerful but does not allow for editing (because it shows aggregated data). If you need to modify anything go to the Statistical Control or to the Batches section. 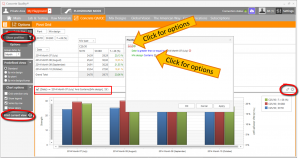 Options panel: here you will find many options for data visualization and customization. 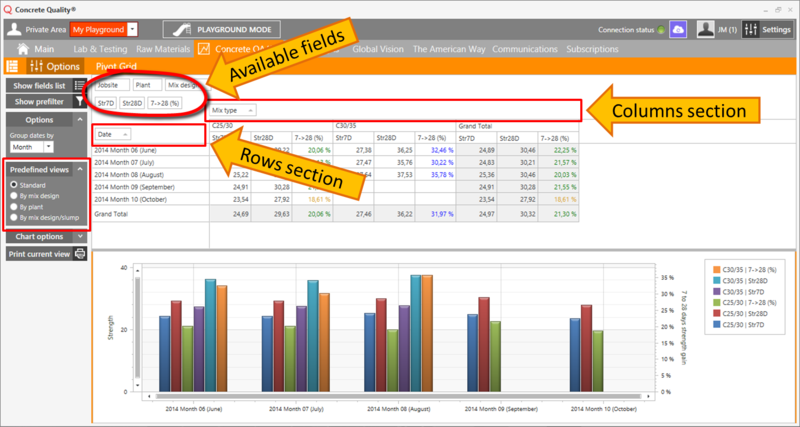 Show/hide the available fields list, show/hide the filter window, date grouping options, predefined views, chart visualization options and printing. Pivot Grid: this is the main feature of this screen. Here you can modify the Pivot Grid’s columns and rows arrangement, so you can analyze your information in any way you want. It will also show you the aggregated data according to the current configuration. 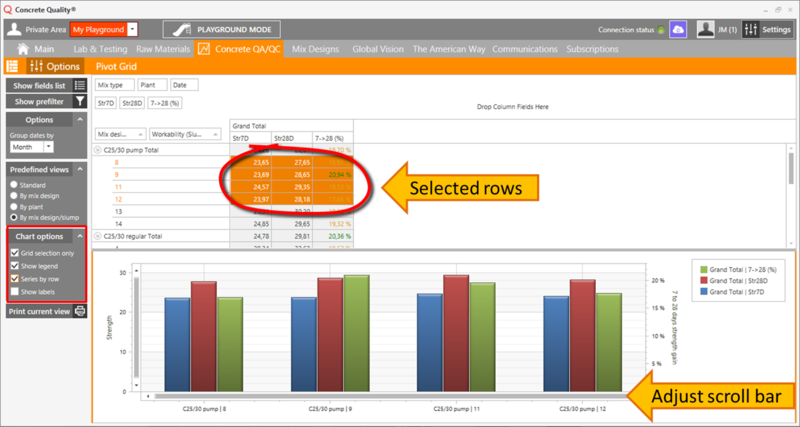 Chart: this panel shows the same data as the Pivot Grid in a column series chart. Makes it easier to analyze information. The chart will update automatically according to the columns and rows configuration of the Pivot Grid. The main advantage of the Pivot Grid is that you can create an endless number of different views out of the same data. By dragging the different fields into the columns and rows sections, and then putting them in different order you can customize the data visualization. Standard: shows the 7 and 28 days strengths for different mix types as they change over time. You can see the date in the rows section, and the mix type in the columns section. By changing the date grouping option you can see them grouped by day, week, month, quarter or year. By Mix Design: this view shows you the different mix designs grouped by mix type. You can easily compare the 7 and 28 days strengths of all your mix designs. 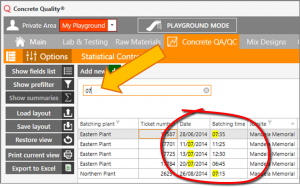 By Plant: with the batching plant field in the rows section and the mix type in the columns section, you get a quick view of the performance of your batching plants for each type of concrete, comparing 7 and 28 days strengths. 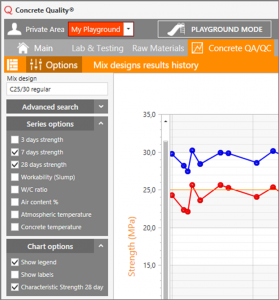 By Mix Design/Slump: very useful view to assess the effect of slump on concrete strength. 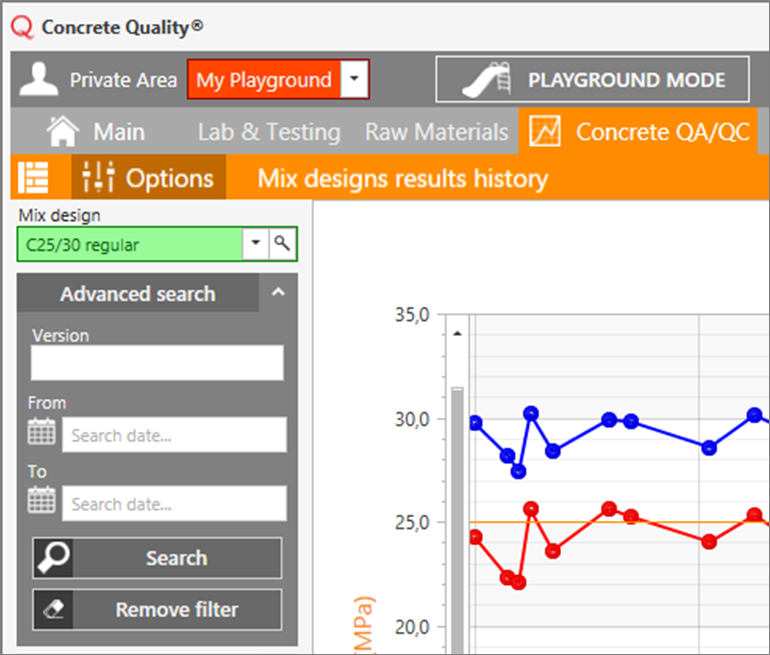 Also lets you see which mix design is more sensitive or more robust to changes in workability. 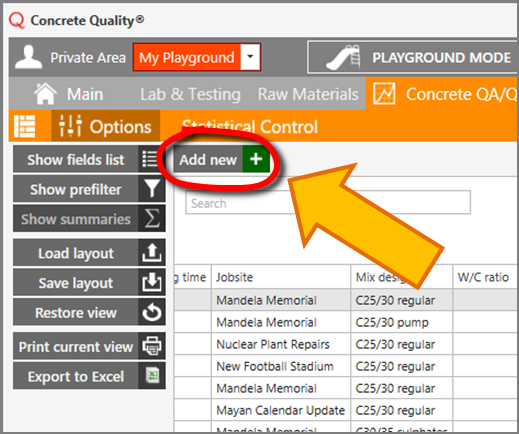 You’ll find the Mix Design field in the rows section, with the Workability/Slump field as a secondary category also in the rows section. Play with the different views, modify them and create your own. In no time you’ll see how powerful this tool is! 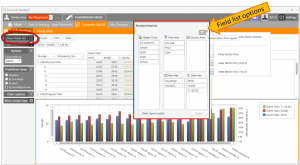 In the same way that you can add and remove columns with the Statistical Control table, you can add and remove fields with the Pivot Grid. 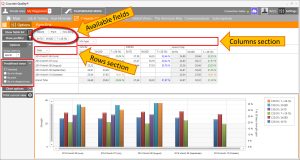 You will easily notice that the fields of the Pivot Grid correspond to the columns of the Statistical Control table; that’s because they are the same and contain the same data. When you click the Show Fields List button in the Options panel, a popup window will open. In this window you can see the hidden fields and you can also create a new arrangement for the Pivot Grid’s view. Hidden Fields: you can drag the fields contained here to any of the other areas of this window, or directly into the Pivot Grid. When you remove a field by dragging it outside the Pivot Grid you will see it here. 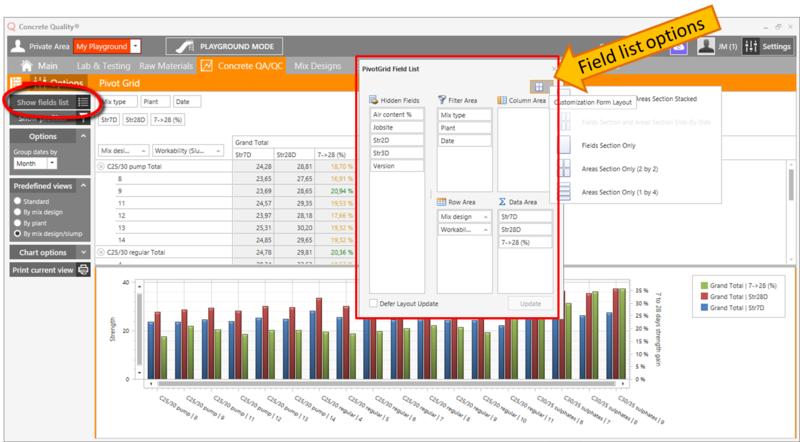 Filter Area: the fields in the filter area allow you to trim the amount of information that will be displayed inside the Pivot Grid. You can have any number of fields here, they won’t affect the data view if no filter is set to them. Column Area: same as the column area in the Pivot Grid, you can drag fields here or directly into the Pivot Grid’s column area indistinctly. In some cases using the Field List window is more convenient, especially if the number of fields in the view is high. You can also sort the fields by dragging them inside this area. Row Area: same as the column area, it has the same features but related to the rows of the Pivot Grid. Data Area: here you can select what data you want to analyze. By default you have the 7 and 28 days strength and the 7 to 28 days strength increase (percentage). The values in the Data Area are the ones represented in the Chart, and they are an average of all the points that match the column/row category. In the Field List window you can also open a configurations panel for it. It will let you see the different areas in alternative arrangements, following the same arrangements that you will find in the Excel’s pivot grid. You will find the Chart’s options in the Options panel. Click on the Chart Options header to expand/collapse it. The different options apply only to the way that the Chart represents the Pivot Grid’s data, they will not modify the Pivot Grid’s arrangement. Grid Selection Only: in cases where the amount of data is very high the chart may become hard to read. For these situations you can make a cell selection in the Pivot Grid, and the chart will only show the selected cells. Show Legend: this option shows/hides the chart’s legend. 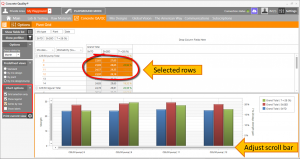 Series by Rows: this option defines wether the series represent the Pivot Grid’s rows or columns. Use it to represent your data from different points of view. Show Labels: this option will show/hide the series’ labels. With many data points and series it’s recommended to hide the labels. The Chart also features zooming and scrolling features. You can use your mouse wheel to zoom in or out, drag the chart to navigate it, and also enlarge/shrink the horizontal and vertical scroll bars to adjust the zoom. It’s very intuitive, just try it out and you’ll get the hang of it in no time! 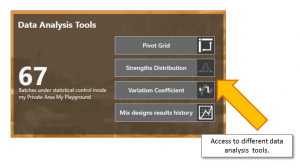 As well as the Statistical Control table, the Pivot Grid features advanced filtering and printing options. Click on the Show Prefilter button in the Options panel to open the Filter Editor window. Here you can define any type of filter you can imagine. Click on the conditions (red text), fields (green text) and criteria (blue text) to customize your filter. You can remove conditions with the red cross button next to each one of them. Once a filter is applied, you’ll see it in the bottom bar of the Pivot Grid; you can activate and deactivate the filter by checking/unchecking it. On the bottom right corner you’ll find icons that will let you customize and remove the filter. Finally, you can use the Print Current View button in the Options panel to send the Privot Grid with its current arrangement to your printer. This allows also to export it to PDF or any other document type. The Stengths Distribution tool offers a customizable histogram chart that will allow you to quickly assess the distribution and dispersion of the 7 and 28 days strengths. 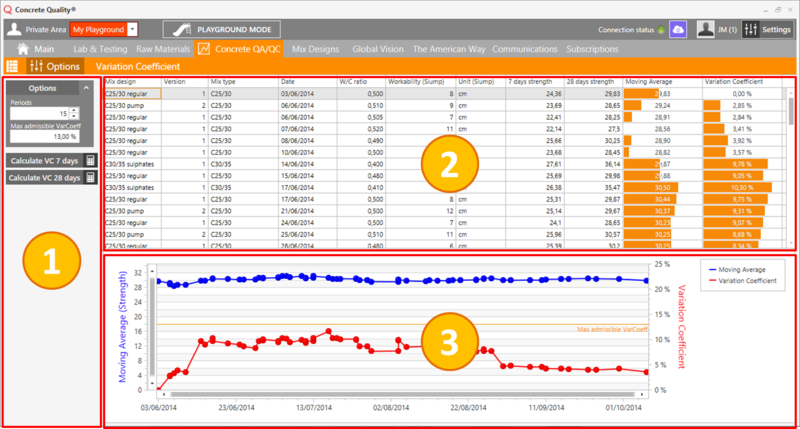 You can apply advanced filters to compare mix designs, time periods, batching plants, etc. 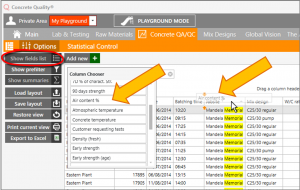 Filters and Options: here you can configure exactly which concrete batches you want to include in the chart. You can filter by Mix Design and Version, Characteristic 28 days Strength, Air Entrained yes/no, and sampling dates. You can also select the strength unit (MPa, Psi, etc.) and the interval for the chart’s series. 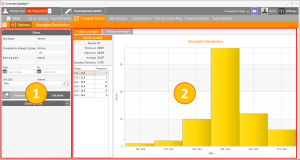 Distribution Charts: here you’ll find a chart for 7 days strengths and another one for 28 days strengths. Just click on the tab headers to switch between them. 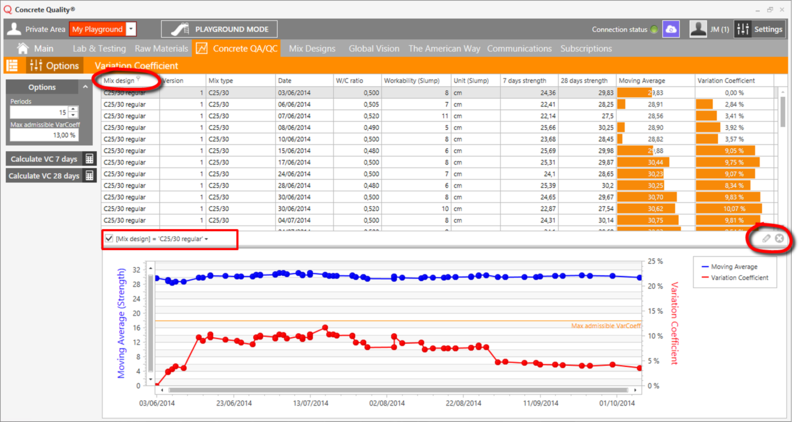 This panel will display a summary of the results, the frequency for evey range and the corresponding histogram chart. The filtering is quite straightforward, just select any of the available filters from the drop-down menu in each category. Keep in mind that the filters are cummulative, so if you select a batching plant and a jobsite, you’ll get only the samples that meet both criteria. You can use the remove filter button to clear your selections. 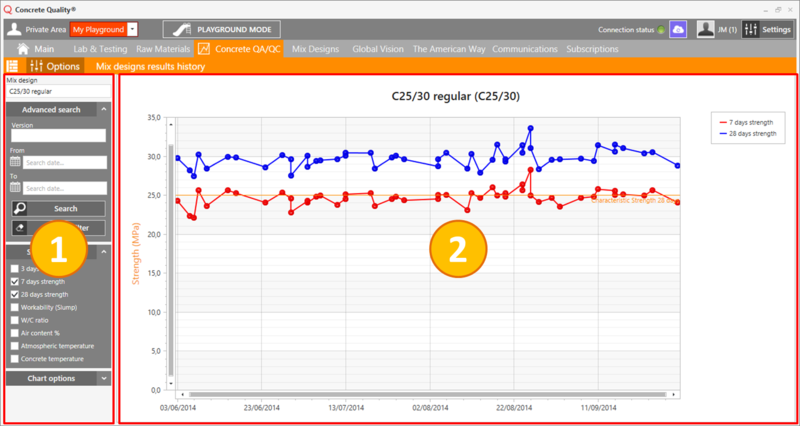 After modifying the filters you need to click the Calculate button to recalculate the values and redraw the chart. 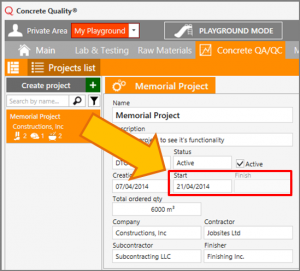 Modify the interval option to increase or decrease the level of details. A lower interval value will generate more categories in the chart. The minimum and maximum values for the categories are calculated automatically according with the available data. In the charts options you can select to show or hide the chart’s labels. This option will affect both 7 and 28 days charts. This tools lets you calculate the Variation Coefficient (VC) for your production in just a few seconds. The Variation Coefficient helps you determine the statibility of the production process; a high VC indicates that there are some factors that make the production process not repeatable, thus leading to a high dispersion of test results. Options panel: here you can set the number of periods to use for calculation purposes, and define a maximum VC limit according to your local standards or evaluation needs. The number of periods will be used to calculate both the Moving Average and the Variation Coefficient. Here you can also choose to calculate for 7 or 28 days strengths. Data Table: Here is where you can visualize your raw data, and where you will see each point’s Moving Average and Variation Coefficient in detail. 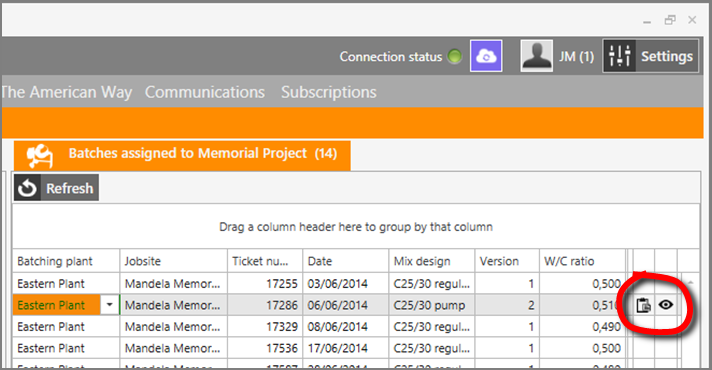 Use the column headers to apply filters and sort your data prior to calculation. VC Chart: a convenient graphical representation of the calculation results. You can easily detect if the VC is higher than the established limit for any point, and see trends and jumps in the data. Use your mouse wheel to zoom in/out, drag to scroll and move along the chart, and change the horizontal and vertical scrollbars’ sizes to zoom in one axis at a time. You can use the autofilter function of the column headers to filter your data prior to calculation. To do that, hover over the column headers and click on the filter icon that will show up; use the filter popup to select the items you want to filter by. As with other tables, when you apply a filter you will see it described at the bottom part of the table, where you can check and uncheck it to apply it or not. When you first enter this screen the data will be sorted by date, with oldest samples on top and newest at the botom. You can modify this sorting by clicking on the column headers, but we remind you that the calculations will always be performed with the data sorted by date. The reason for this is that the VC only makes sense when analyzed historically. 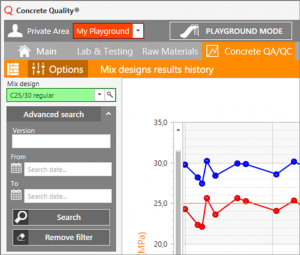 The Mix Designs Results History screen is a practical tool to quickly evaluate the evolution of the key performance indicators of mix designs over time. You can see seasonal effects, study the relationship between slump and compressive strength, etc. It’s intended to be a simple and straightforward tool for all users, from novices to experts. 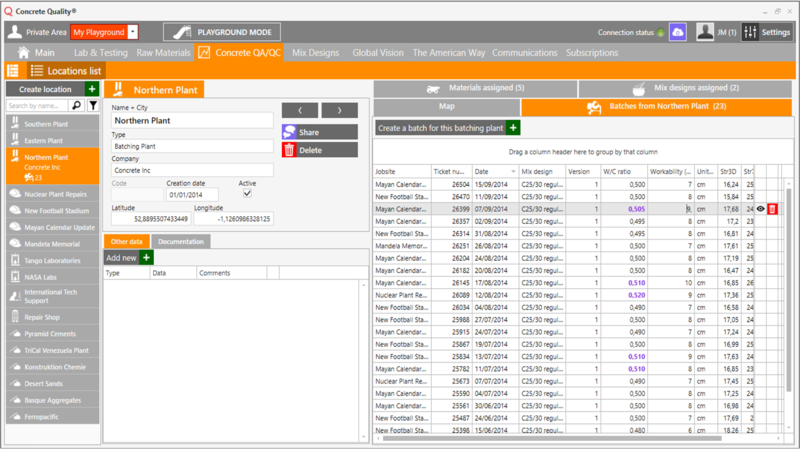 Options panel: Here you can select the mix design you want to analyze , select any number of its versions, and set minimum and maximum dates. All concrete batches matching these criteria will be shown in the chart. You can also select which test results to show: 3, 7 and 28 days strengths, W/C ratio, slump, air content, temperatures, etc. Some of these series will be shown with their own axis. Finally, you have some chart options to modify the level of information displayed on the chart. Results Chart: this is the main area, where you can visualize the data based on your selections in the Options panel. You can use the mouse wheel to zoom in and out, drag the chart area to navigate it, and modify the horizontal and vertical scrollbars’ sizes to modify the zoom. 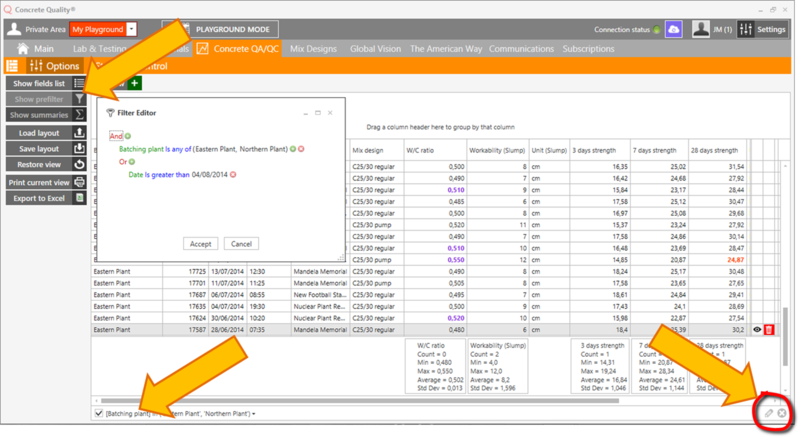 When hovering over the chart a vertical guideline will appear, with a popup showing detailed information about the data points. 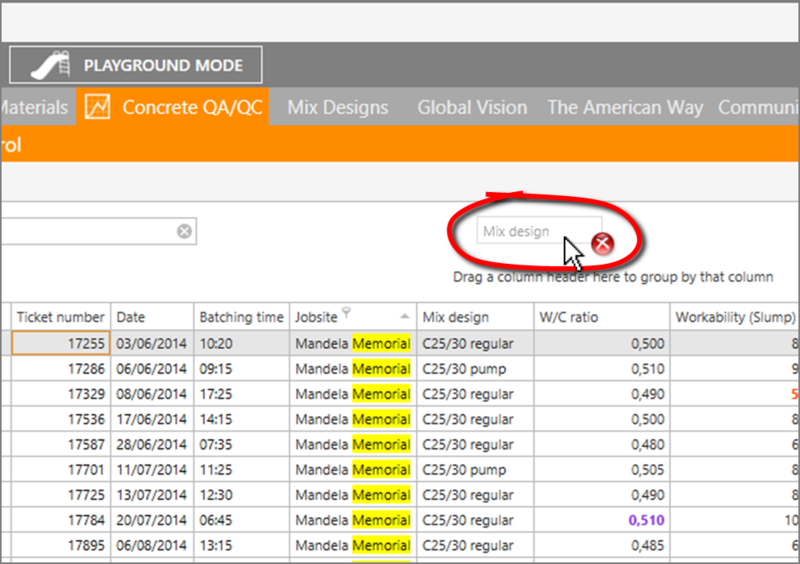 In the Options panel you can select the Mix Design you want to analyze with the selector you’ll see on top. After selecting a mix design, you can use the advanced search panel to narrow your selection. Use the Version’s selector to select one or many versions of the selected Mix Design. 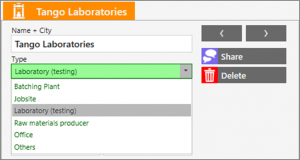 This is useful to compare differente versions and see the results for each one, or to remove test versions from the filter to analyze production versions only. Besides that, you can select the minimum and maximum date to display. Keep in mind that the dates you select are the batching dates, not the dates when the strengths were tested. The Results History tool has many visualization options that will help you get exactly the information you need. 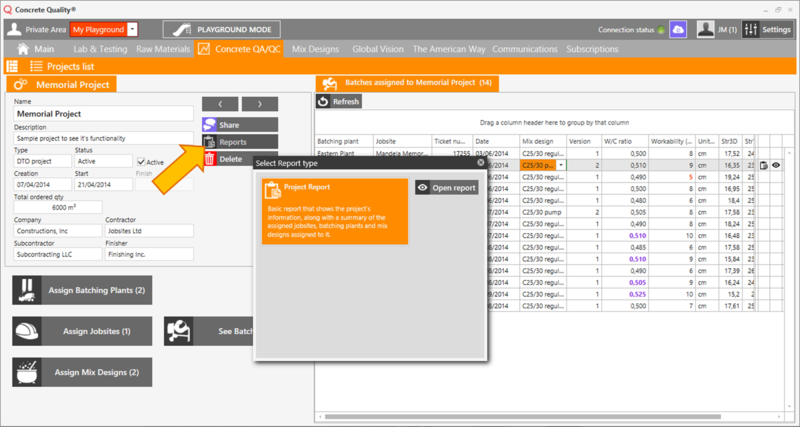 In the Options Panel you can select which series to represent in the chart, and also configure the chart’s appearance. For the series you will see all strength-related series represented on the left (primary) axis. Other series have their own (secondary) axes, which will be displayed on the right side of the chart. 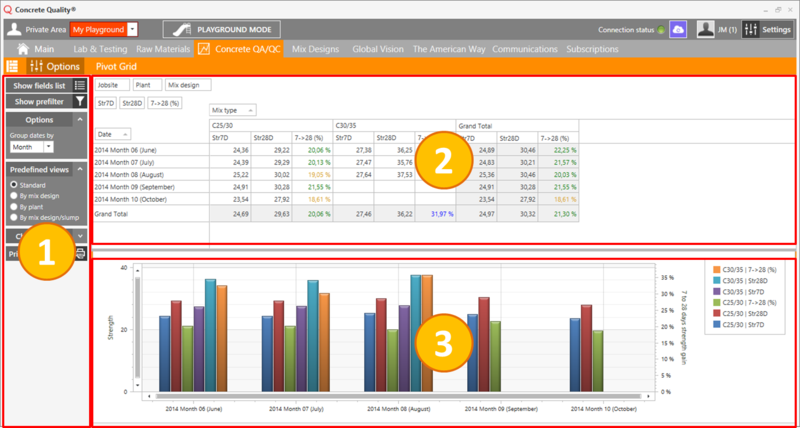 Secondary axes are shown so that you can see all data with a meaningful scale at the same time. The Chart options show/hide different chart elements that help you with the visualization of the data. Modifying these options will not affect the filter applied to the data. You can also zoom in/out on the chart with your mouse wheel, move around by dragging the chart area, and modify the horizontal and vertical scrollbars’ sizes to zoom on a specific dimension.